This Leek and Potato Soup is sponsored by Mariani™ Family Orchards, all thoughts and opinions expressed here are my own. Leek and Potato Soup, made with healthy vegetables and creamy potatoes, is rich and comforting without the need for heavy creams or butter. Perfect for lunch, dinner, or served as an easy holiday starter, you’ll love this healthy Cauliflower Leek and Potato Soup. 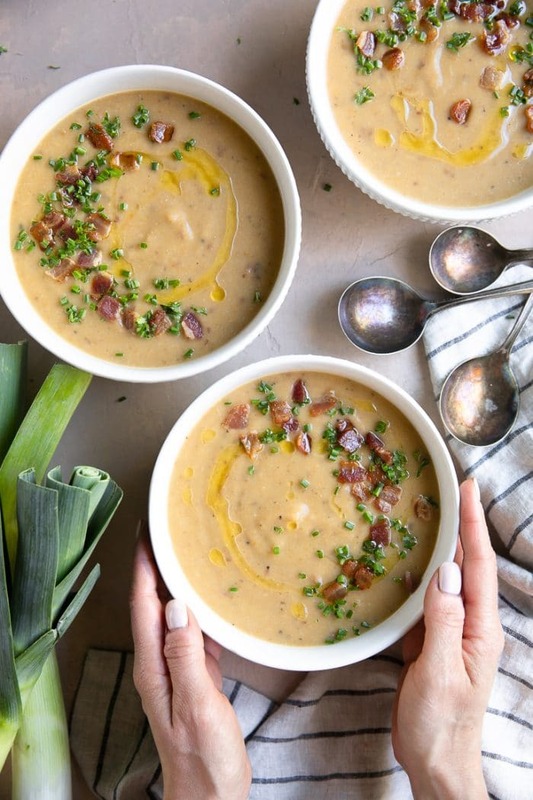 I am so excited to share this leek and potato soup with you guys today! It’s creamy, comforting, easy to prepare, and tastes delicious. 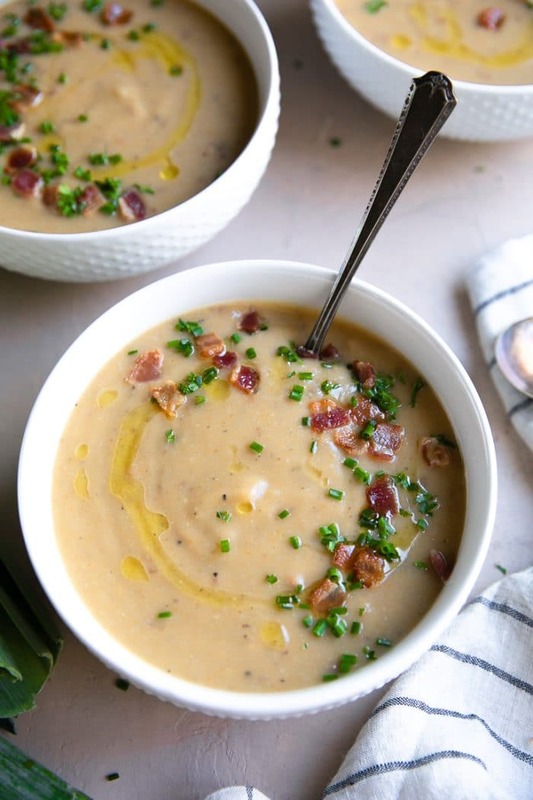 Unlike traditional potato leek soup, this version is completely dairy-free. No butter, no cheese, no cream. 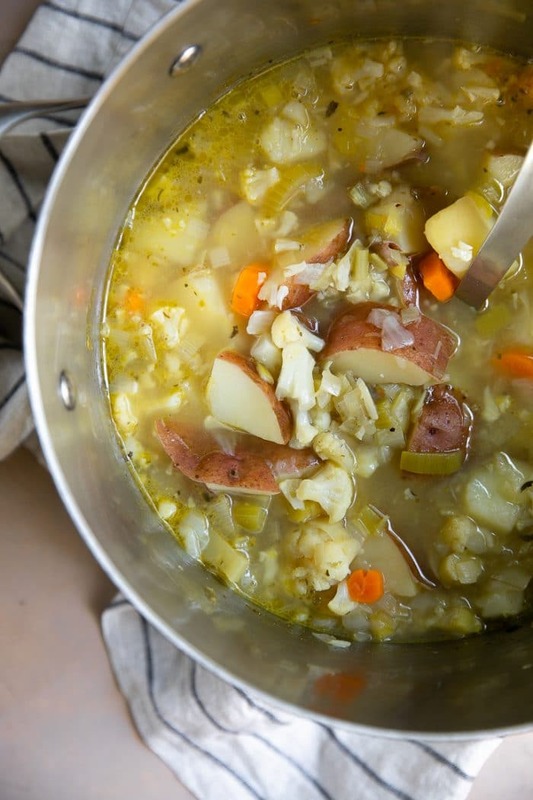 Filled with cauliflower, leeks, potatoes, and Mariani Walnutmilk, this soup will leave your body feeling like a million bucks. Some of you may be thinking, why Walnutmilk? Why not just use soy milk or almond milk? Walnutmilk is pretty amazing when combined with warm liquid. This isn’t always the case with dairy-free milk alternatives. So, soup (like this leek and potato soup) or sauces, like this Saffron Tomato Sauce that I made to go with these Middle Eastern Meatballs were so perfectly creamy, without any weird separation and definitely without the cream hangover. It’s a rich source of calcium. Significantly less sugar than dairy milk or other plant-based milk (1 cup of Original Mariani Walnutmilk has 4 grams of sugar, Unsweetened has 0 grams, and Vanilla has 8 grams). Only 45 calories per eight-ounce serving. Walnuts are a significant source of ALA, a plant-based omega-3 fatty acid that has been found to benefit heart health. Mariani Walnutmilk is gluten, dairy, lactose, and soy-free. No artificial colors, flavors, or carrageenan. And it’s made with 100% California-grown walnuts. FIND MARIANI WALNUTMILK IN A STORE NEAR YOU. To make this soup, you first start by cleaning the leeks. Cleaning leeks require more time and patience than simply running them under water. As the dirt and soil tend to hide within their layers, you will need to trim, chop, and soak the leeks in water. Chop off the end of each leek, followed by the tough, dark green tops. You only want to eat the white and light green parts. Chop the white and light green parts into 1/2-inch thick rounds. Transfer to a bowl filled with cold water. Use your hands to separate the leeks, thus removing any dirt that may be stuck between the layers. Agitate the water, rinsing with fresh, clean water once or twice if leeks are especially dirty. Once clean, remove the leeks with a slotted spoon and use a salad spinner to dry thoroughly. Once the leeks have been cleaned, you may get started with the rest of the soup. 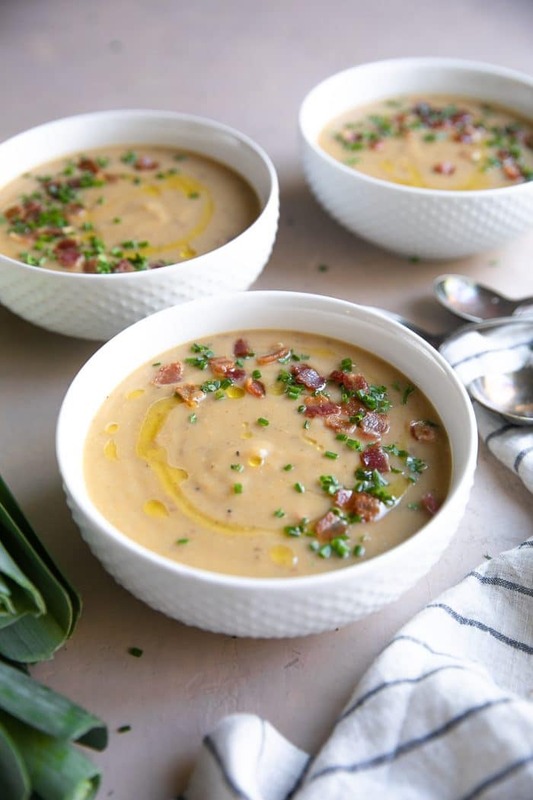 In this leek and potato soup recipe, I chose to add bacon. 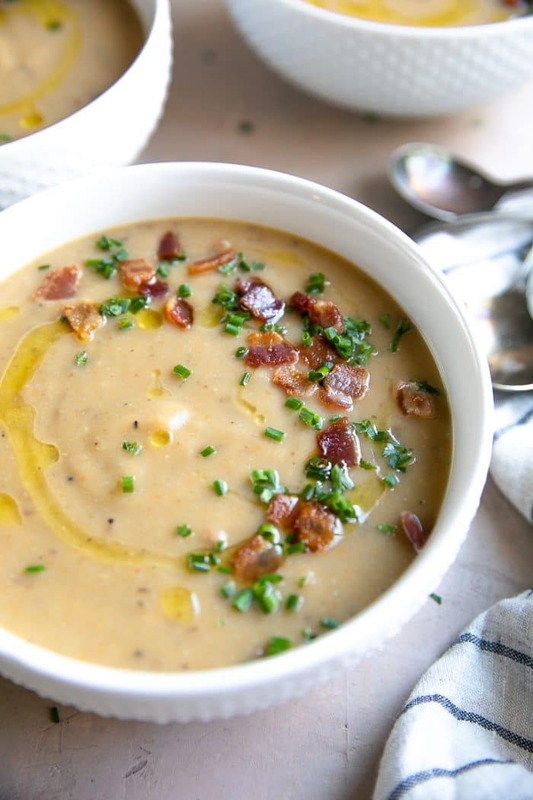 Bacon adds depth and flavor but is not a requirement for this soup. If you are not a fan of bacon, feel free to leave it out. I also used bacon grease in place of the butter that is usually required in this soup. 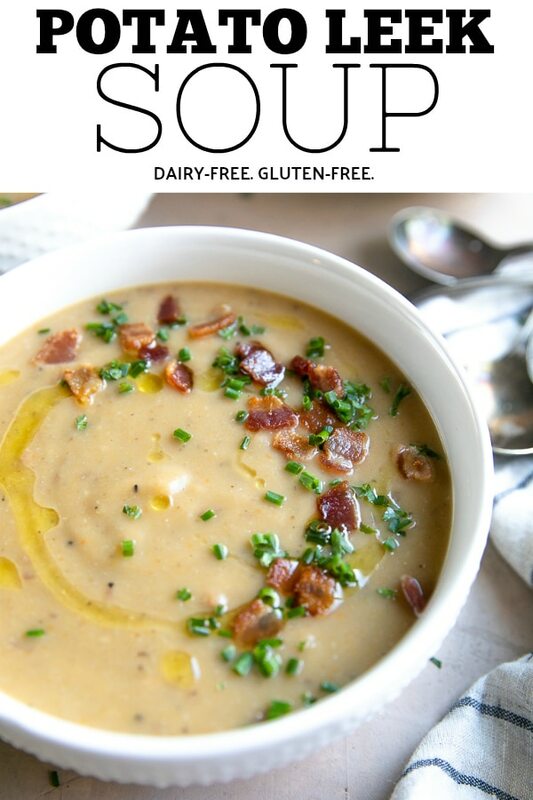 Should you wish to make this soup without the bacon and still keep it dairy-free, simply replace with olive oil or a dairy-free shorting or butter spread. Once the leeks and bacon have been prepared, the rest is easy. Being the vegetable lover that I am, I wanted to add more than just potatoes and leeks to this leek and potato soup. Onion, garlic, carrot, and celery, are must-haves when I prepare almost any soup. The combination of these four ingredients contributes the soup flavor that makes soup so comforting. If you’ve been to my site before, you may have noticed that I really love cauliflower. It’s healthy, delicious, low-calorie, and low in carbohydrates. Cauliflower also makes a great substitute for potatoes. I chose to cut back on the total amount of potatoes in this potato and leek soup and add cauliflower instead. The result was still creamy and delicious and, in my opinion, you would never know that cauliflower was used instead of potatoes. You don’t have to do this. If you prefer potatoes, go with potatoes. I am simply all about options. So you have all the vegetables cooked and softened. Now what? Now it’s time to blend this leek and potato soup and make it…soup! But first, you must decide if you want your soup to be completely creamy or somewhat chunky. Each version is equally easy. The only difference between the two is that for the completely creamy soup, you will be blending the entire soup, whereas, with the chunky soup, you will only need to blend half. Immersion (hand) blender. This is what I used for this soup. Immersion blenders work great because you don’t have to worry about removing the soup from the pot. Regular high-speed blender. What I used for years to puree and blend my soups together. Works amazing, just take care when pureeing hot soup. Always work in batches. Food Processor. I think I have only tried using a food processor for soup…once. It works just fine and definitely gets the job done, but the blender or immersion blender and definitely my go-to. Can you freeze this Cauliflower Leek and Potato Soup? Yes. This is a great soup to freeze. Especially if you want to make a big batch and save half for later. 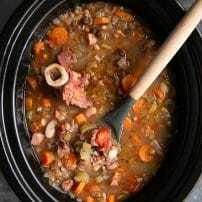 To do this, simply allow the soup to cool for approximately one hour before transferring to the refrigerator. 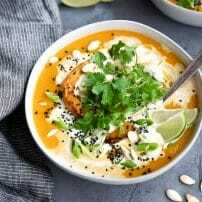 You don’t want to leave the soup out for too long at room temperature, however, it’s also bad to place a hot pot of soup directly in the refrigerator. Once the soup has cooled to room temperature or cooler (you can always freeze the next day), portion the soup into freezer bags or freezer safe containers. Remove as much air as possible before transferring to the freezer. If you just have a small portion of leftovers, this soup is terrific up to 3 days leftover in the refrigerator. If you try making this Leek and Potato Soup, please leave me a comment and let me know! I always love to hear your thoughts. 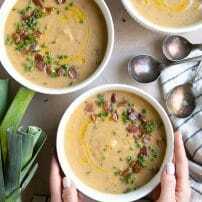 DON’T FORGET TO PIN THIS LEEK AND POTATO SOUP TO MAKE FOR A FAST, EASY, AND VEGETABLE-FILLED DINNER, OR ANY OTHER TIME YOU WANT TO MAKE A BIG BOWL OF COMFORTING SOUP. Leek and Potato Soup, made with healthy vegetables and creamy potatoes, is rich and comforting without the need for heavy creams or butter. Perfect for lunch, dinner, or served as an easy holiday starter, you'll love this healthy Cauliflower Leek and Potato Soup. Clean and cut the leeks- First, chop off the end of each leek and the tough, dark green tops. Chop the white and light green parts into 1/2-inch thick rounds and transfer to a bowl filled with cold water. Use your hands to separate the leeks, thus removing any dirt that may be stuck between the layers. Once clean, remove the leeks with a slotted spoon and set aside. Prepare the bacon- Arrange bacon in a large skillet, working in batches if necessary. Turn heat to medium and cook the bacon until the edges start to curl (approximately 3-4 minutes). Flip the bacon and cook the other side until fully cooked and crispy. Remove the bacon to a clean plate lined with paper towels. Reserve the bacon fat. Add two tablespoons bacon grease to a large soup pot set over medium-high heat. Add the onion to the pot. Sauté the onion for 3-4 minutes or until just started to soften and turn translucent. Add the leeks, carrots and celery to the pot and mix well to combine. Cook an additional 3-4 minutes, stirring occasionally. Season with salt and pepper, and stir in the minced garlic and Italian seasoning. Cook for an additional minute. Add the potatoes, cauliflower, and vegetable broth to the pot and stir to combine. Bring soup to a low boil, cover, and reduce heat to low. Simmer for 30 minutes, or until vegetables are soft and fully cooked. Use an immersion (hand) blender, standing blender, or food processor to blend the soup. 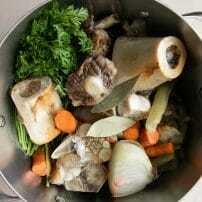 For a smooth soup, you may blend the whole thing, or, for a chunky soup, simply blend half the pot. 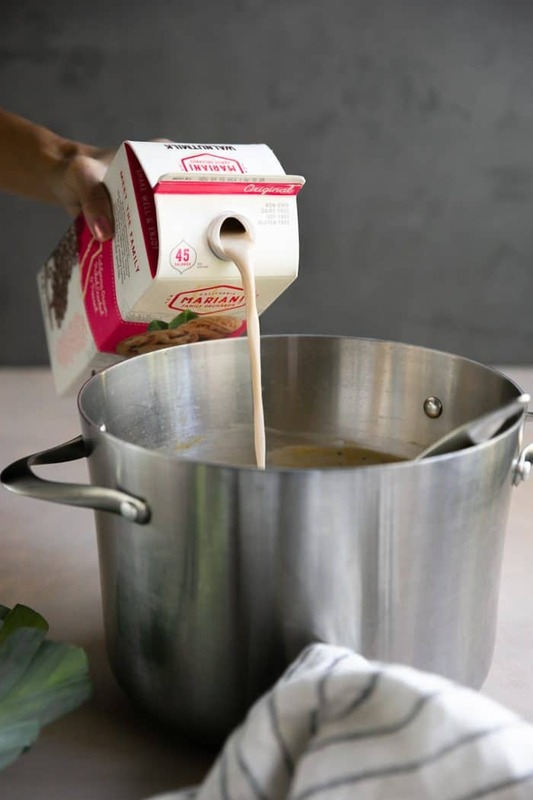 Return soup to the pot over low heat and stir in the Mariani Walnutmilk, adding more or less depending on how thick you prefer your soup. Season with additional salt and pepper, to taste. Garnish with fresh chives, chopped bacon bits, and a drizzle of (good) olive oil, if desired. Enjoy! This recipe looks amazing. 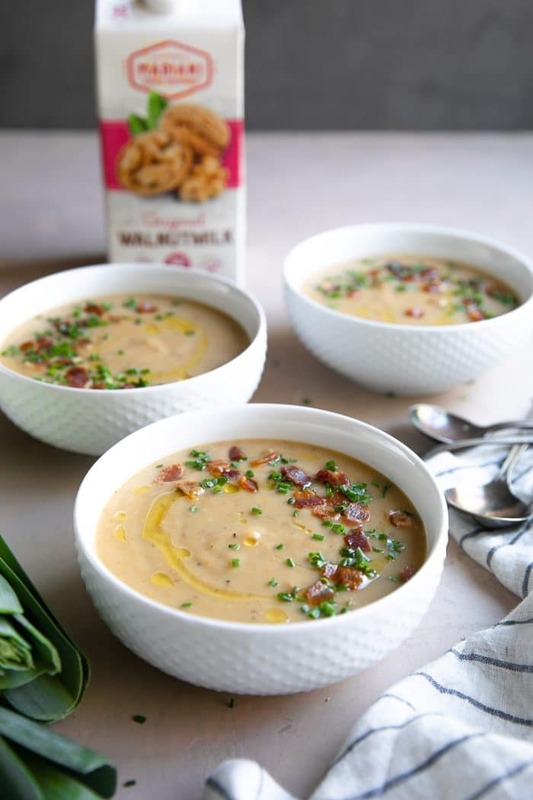 I enjoy dairy free options because my tummy is sensitive to milk and creams, that being said I also take a thyroid medication that gives me an allergic reaction to walnuts… any suggestions on an alternative for the walnut milk to keep the creamy texture in this soup? I have not tried it with any other dairy-free alternative milk, so I cannot make any recommendations. If you do try, please make sure to use a plain variety – i.e. not vanilla. Any other vegan or nut milk should work – almond, coconut (very creamy), soy, cashew, rice, etc. I am going to make this tomorrow with coconut or maybe a mix of coconut and almond. Good luck!